This affordable little wonder offers fast, precise, repeatable fence positioning at a fraction of the cost of other jigs. If you want to improve the speed and accuracy of intricate router table projects like cutting dovetail and box joints, but you don't have a lot to invest, the return of the original Incra Jig is a dream come true. Best of all, the Incra Jig's patented incremental rack system and positioning scales make it exceptionally easy to use. Now precision joinery techniques, and a host of other precision millwork, sawing, and drilling operations, are in easy reach of every skill level. 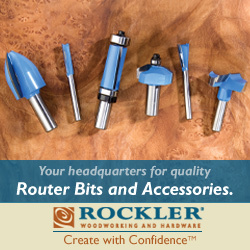 Over the last several years, router manufacturers developed self-releasing router collets in an attempt to end the problem of stuck bits. To a large degree, the new collets have done just that. It remains possible to have a bit hang up in the collet but those instances are far less common. 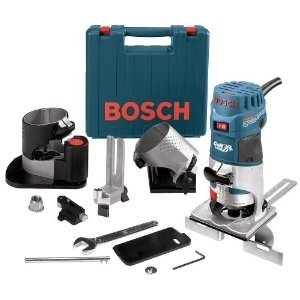 Bearing tipped router bits extend the versatility of a router table by making it possible to get consistent width cuts in straight or curved stock that would be difficult to do using a fence. The problem with these freehand operations is starting the cut safely. Guide bushings are simple devices that when used properly, extend the capabilities of your router. The bushing fits into the hole in the routers base-plate and is designed to follow a template, which guides the router bit, transferring the templates shape to another piece of wood. If you can use a plunge router, you can cut strong and perfectly fitting mortise and tenon joints in no time. Easily rout single, double, twin, quadruple or even triple mortise and tenon joints, plus angled and compound-angled joints, in stock up to 3" x 5". Virtually any plunge router will fit and still be available in seconds for other uses. Use a basic router bit in a new way to dress up those frame-and-panel doors. Cope-and-stick joinery produces great-looking frames for cabinet doors, but you need specialized router bits or shaper cutters to do the job the traditional way. Those items don't come cheap. So we found a low-cost, low-tech alternative, based on a simple dovetail bit. Do you love everything router? Is the router table your most favorite tool in the shop? If have mastered your router table and are looking for a whole new realm of woodworking, you might want to check out the Legacy ornamental mill. This is the ultimate in woodworking with a router. Routers for hand use require some sort of sub-base. There are safety and control problems without them. Whether you choose to use the OEM plate, one of mine or one of the competition's, you should be using one. For the multitude of router apps, there are usually sub-bases to accommodate. They differ in size, shape, material and thickness. They are commonly made of metal and plastic, though MDF, Masonite, plywood, and fabric (phenolic laminates) are just as common. This discussion is about Acrylic.